We've got a new Anything Goes Challenge for you at The House That Stamps Built! It's a favorite around here. With American Independence Day only a few days off, I wanted to create a card to celebrate that. I used some older Authentique papers for the background - I don't usually do layer cards any more, but this one was a fun change for me. 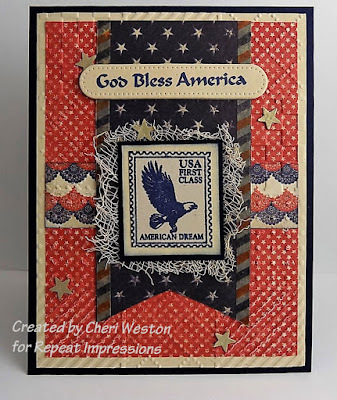 I went with a vintage look using RI Stamps #3711-G "God Bless America" and #4902-F "American Dream Post". I mounted the postal image against some stained cheesecloth and I love the results. Wishing all my American friends a safe and happy Independence Day! Love your “vintage” card. The eagle postage really is a beautiful piece. Great job on this challenge. I like the texture you have created with the cheesecloth! Great card. 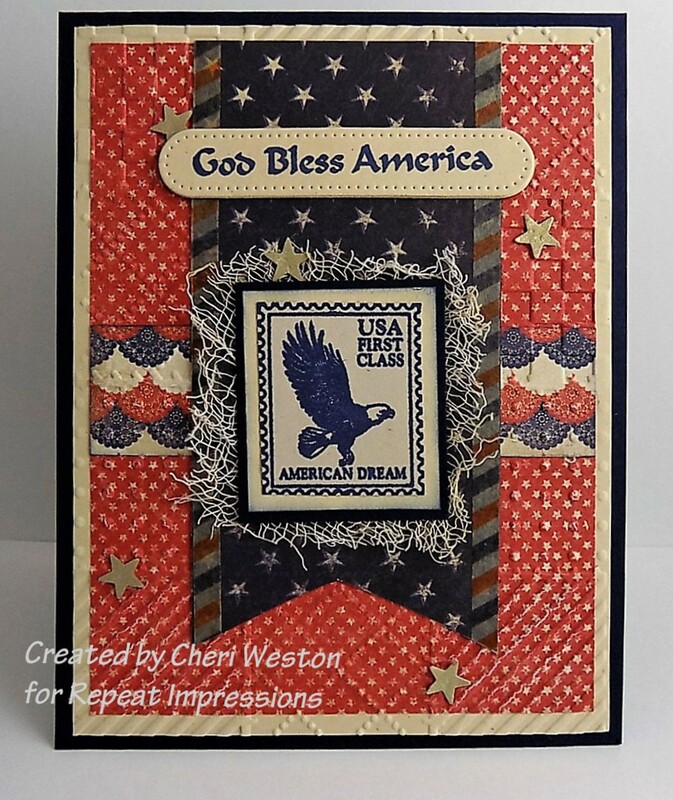 What a stunning patriotic card with all the layers and stars! Oh Cheri, your card is absolutely perfect! Love the cheesecloth behind your stamped image and the over-all vintage feel of your fabulous card! A very patriotic card, Cheri. Fabulous card SS. Very patriotic. Love your layout. Wow! Great layout. I like the mesh you added behind the eagle stamp panel, kind of resembles a "nest" - totally awesome! This is so gorgeous!! love the papers you used and I think all the layers are fabulous! The vintage feel is perfect for the image you used.